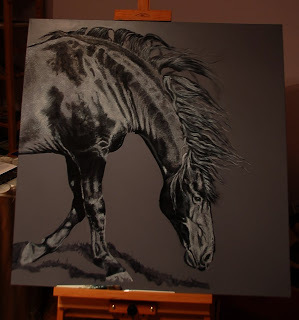 Due to some issues with the big Friesian painting taking forever to dry between layers I have managed to get this painting finished while waiting! 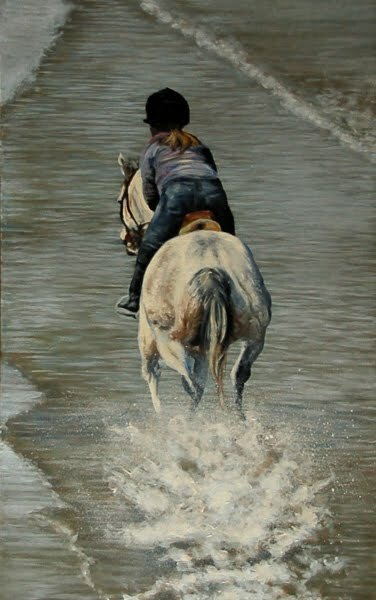 When I was visiting Saltburn beach with family last April there was a young girl and her TB enjoying a good canter up and down. I was stood on the pier looking down when I took the photos that I based this painting on and thought it would suit this long thin canvas that I have had sat prepped for ages. The edges of the box canvas are painted, I'll try and get a photo of it on the wall when the light is a bit better. Another update on this 35" x 35". I had to wait nearly a week for it to dry enough to work on again, so this is just a few more hours spent applying detail in titanium white over the top. 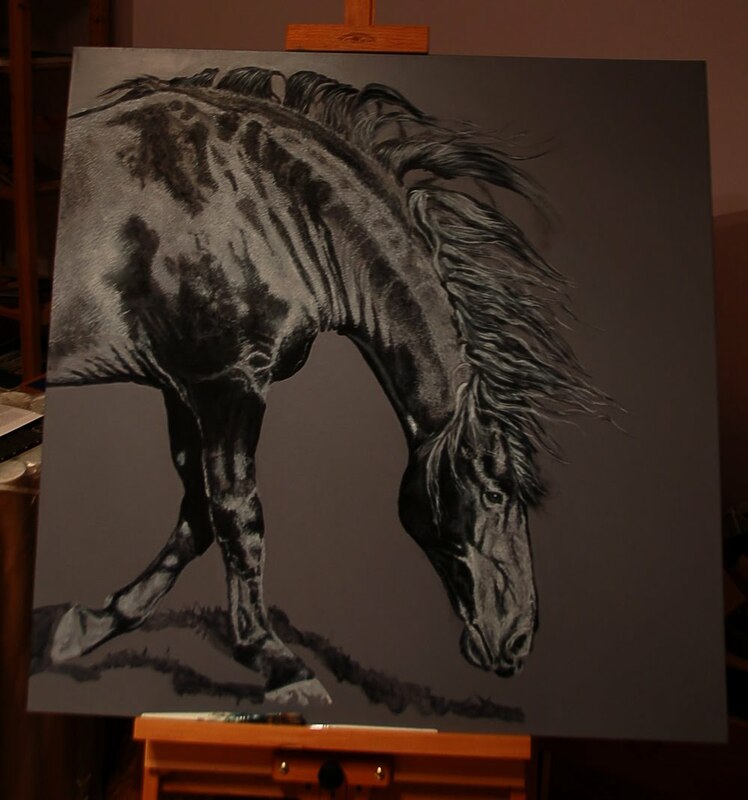 The majority of this painting will be produced using layers of white detail followed by dark glazes over the top, mainly because when I am working with just one colour I can stop and start very easily and make the most of small windows of time that I might get! I can always rely on my small children to wake up from a nap or need me for something just as I get going, so this way I can stop right away and just pick up where I left off! For the first time so far in my 365 2011 project I painted from a photo rather than from life today, and I found it so much easier! All the more reason to carry on I think! 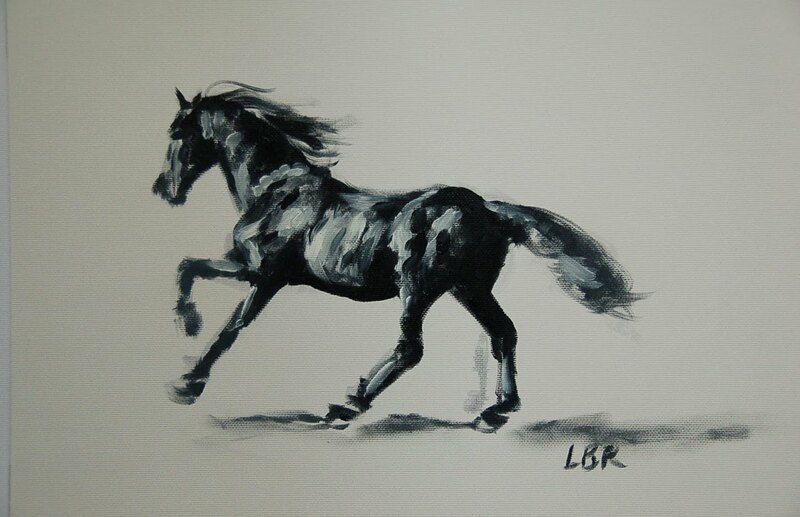 The painting is pictured above, 14" x 10" oil on paper, sketched in 18 minutes. 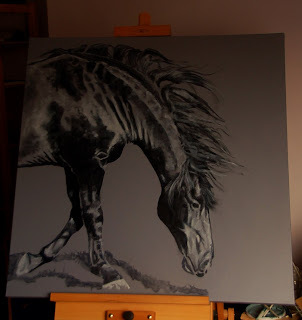 Spent another hour or so roughly sketching in darks and highlights on the new big painting too today, pictured below. Productive day! Feels like it has been so long since I was last working on a proper original so I'm really excited to get properly started on this one. It is 35" x 35" on linen box canvas. I decided I might like the background colour to show through in the horse's coat so once the canvas was gesso'd and sanded to smoothness I put the background colour on and drew on top of that. 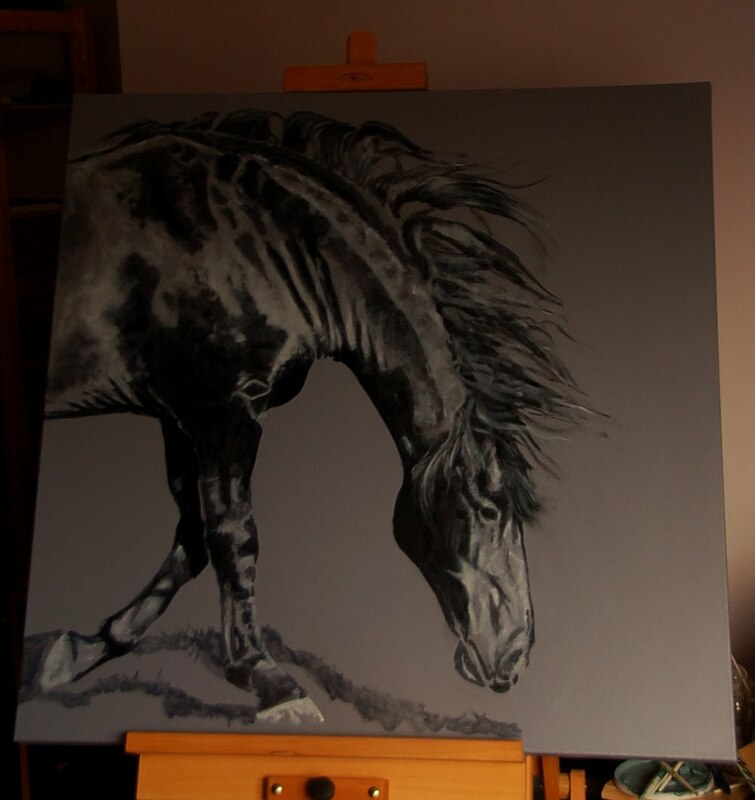 Today I put the first paint on the horse, just the darks sketched in really, but it is fun to see the foundations of the painting (above). Rigged up the photography required to create a time laspe video documenting it's creation so excited about that too! 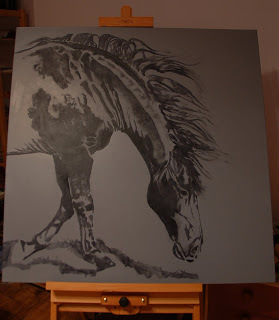 I'm over a week into my 365-2011 painting project and so far I have managed a painting every day and enjoyed it! On a less positive note though, turns out I am RUBBISH at painting like this- fast, and from life! Some of my efforts (actually, most) so far have been truly embarrassing but I have been true to my word and gone straight in with the paint, no drawing, and stopped when my half hour timer buzzer goes off... in some ways I am pleased I'm so dreadful as it will make the journey all the more interesting and I'm sure I must improve after a whole year of doing it? Plus, I really do think my usual work will benefit, even if I do approach it in an almost completely opposite way! The above is my third attempt at a little pony figurine I have had since my childhood. If you want a laugh just visit my 365-2011 Flickr album to see my other attempts at it, not to mention other crimes against art! My next big original is all drawn out over a plain blue background so hoping to get that started tomorrow, can't wait! 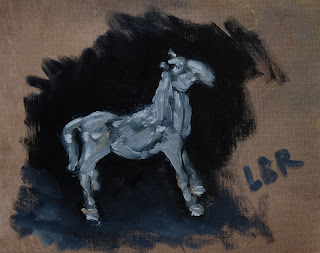 Today I made a start on my goal to paint an oil sketch every single day of 2011, to improve my observation skills, paint handling, to loosen me up a little, and to basically learn lots by pushing myself right out of my comfort zone! I usually paint carefully with tiny brushes and string out my paintings for weeks so using BIG brushes painting alla prima at speed is throwing myself right in the deep end! 1. Each painting may take absolutely no longer than 30 minutes. 2. 1 painting to be produced every day in 2011. 4. The end result really doesn't matter, it's the process that matters! Have decided that I'd rather store all the paintings online in an album rather than a blog, to make them easier to look through, so I have set up a Flickr album here. If you ever need a good giggle then by all means stop by and see how I'm doing hahaha!